For some, being part of a band can be a great experience, giving all of the fulfillment in the music industry they could imagine. For others, it’s the means to getting noticed with the grander thought of flying solo one day and truly making a name for yourself. Today’s featured artist did it all – popular bands, small side acts; he worked with huge names, and worked with family. After nearly 60 years in the business, perhaps he’s best known for his solo work. Stephen Winwood was born in Birmingham, England in 1948. His father worked in a foundry, but was a semi-professional musician on the side. Playing mostly sax and clarinet, young Steve became influenced by swing and jazz music. At age eight he would join his father and brother on stage playing some guitar and drums. His passion for being a vocalist started while being a choirboy at the local church. Upon hearing the great Ray Charles, Steve decided to model his vocal style after his. Being a teenager, Winwood would play backup in the local R&B scene for some of the greatest acts in music history. Muddy Waters, BB King and Bo Diddley are just a couple names he backed while a kid. After the family band, a stint with Eric Clapton and the very well-known band Traffic, Winwood branched out on his own in the late 70s. 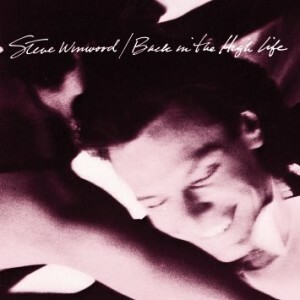 Today we look at his fourth studio album Back In The High Life which was released in June of 1986. Having always recorded in England, Winwood had moved to New York to begin this record. Immediately enlisting the help of fellow high-profile musicians like Joe Walsh and Chaka Kahn, the album was a huge success. It would shoot to the top of the Billboard Hot 100 for the single ‘Higher Love’ and would earn Record of the Year and Best Male Pop Vocal Performance Grammy Awards. While only containing eight tracks, seven of them were released as commercial singles, all within 1986. Currently, it has sold nearly four million copies in the US alone, with a couple million more worldwide. This type of music really takes me back. Pop music of the mid-80s was so incredibly different than what it is today. You could throw on a Steve Winwood album and sing along, not really thinking twice about it. It was simply music to tap your toes to and go about your day. Some might consider this rock, or even have a bit of soul to it – but for me, this is a straight up pop album of the day – and it did its job well. One could argue that 30 years later, this album holds up fairly well. Perhaps some of the synth sounds out of date, but in general, it’s a good listen even by today’s standards. He’s got a great voice, and if you remember the words to the hits, it’s easy to sing along to. I’ll fully admit to tapping my toes a bit to ‘The Finer Things’. At 67 years old, Steve Winwood is still going at it today. He does a lot of session work for some major artists. This era was probably the height of his success, so give this a shot today. You won’t even miss that $5 bucks after you start singing along.